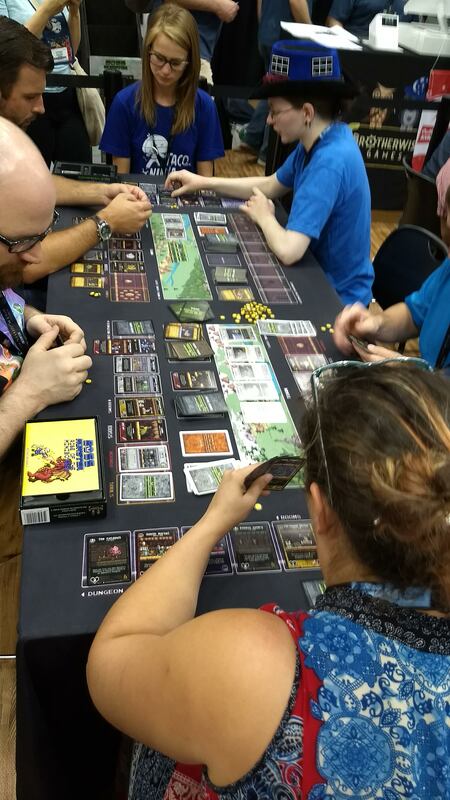 The jury is out among my acquaintances whether the RPGs (role playing games) or TCGs (trading card games) are waxing or waning at GenCon. 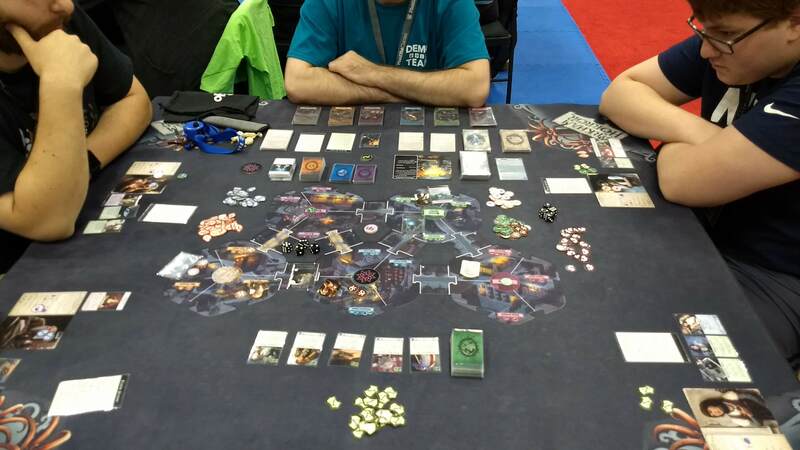 However, it seems to me that the boardgame contingent of GenCon continues to increase. I was able to snag short overviews of many, many games, so I will be breaking my notes into several posts this week. So many games, so little time and all that.. Here’s the first of three posts covering the main group of medium and heavyweight games. 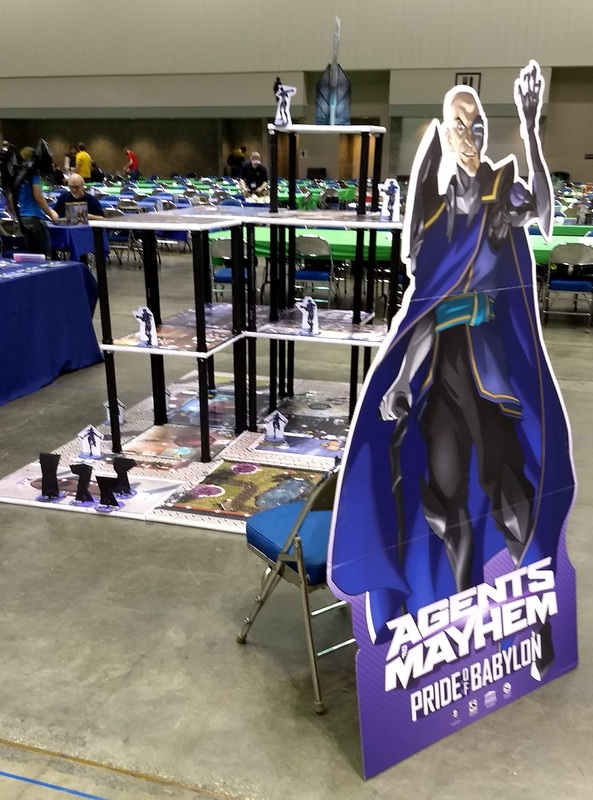 I first saw Agents of Mayhem: Pride of Babylon in the demo hall in its full extra-large scale playable display. With its multi-story buildings (constructed with screw-together plastic building posts for easy setup) even the retail sized game is rather eye-catching. It is a superhero battling game consisting of a 3 vs 3 (always) character match, with only two of the three characters activated each round. On a turn, a character can either make one main action (typically an attack or power), or any number of add-on actions. There are also instant actions that can be taken on any player’s turn. Actions are often paid for with resource cubes. Each player is given two refresh cards at the start of the round. 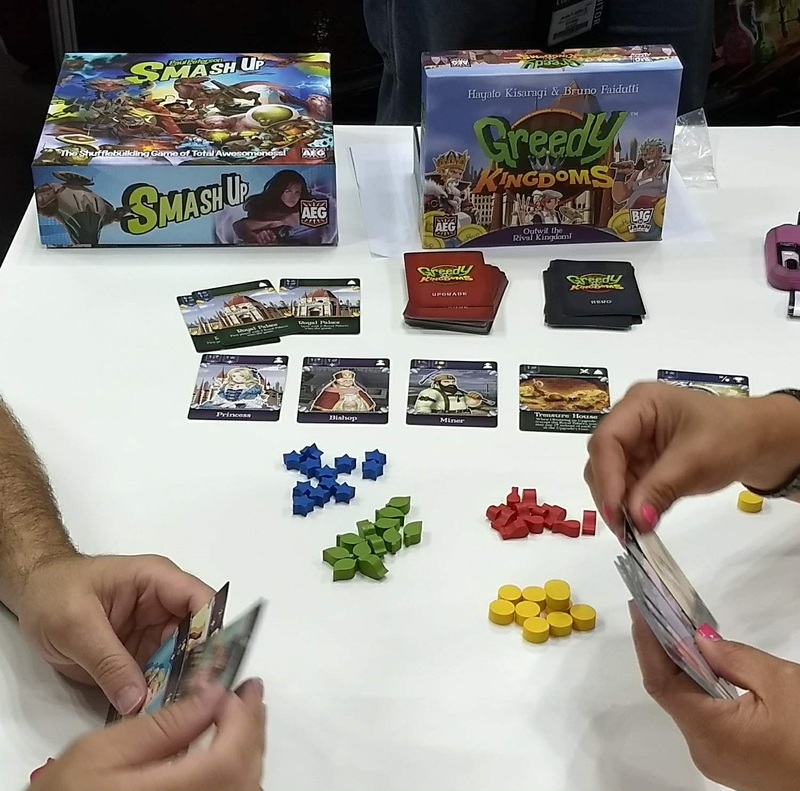 They add cubes to a hero after it completes its turn – the player gets to decide which refresh card to use at that time. Throughout the game, characters can accumulate Mayhem cubes. They can be used to buy a Mayhem ability and are also needed to power that ability. These are the real collateral damage type abilities that make use of the board’s destructible terrain. Characters can vary somewhat, with some missions giving characters different loadouts. There is a campaign mode as well, which gives players additional “stuff” at the end of each scenario. 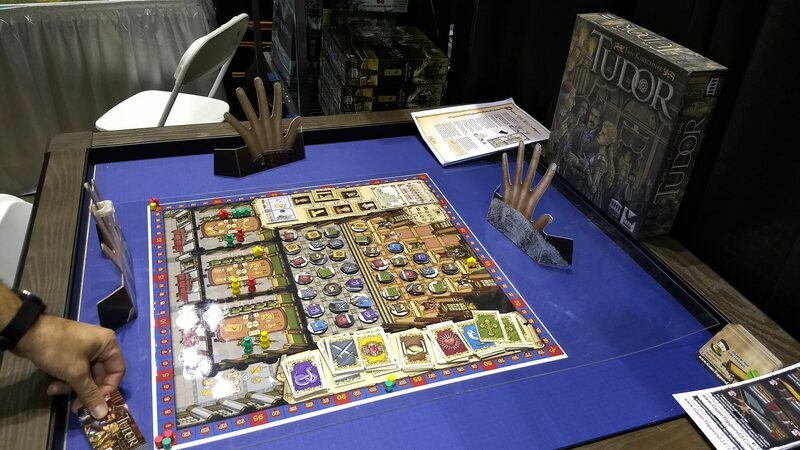 Tudor (which you can still preorder off Kickstarter) is a sort of worker placement game, where the workers are placed at the bottom of the board and are slowly pushed (by following workers) up through the ranks to gain more and more powerful abilities. Workers move in from the hallway into audience chambers which give them different powers. Eventually they enter the throne room itself which is where many of the resources are collected. Finally, some workers may make it all the way to the top of a column to be promoted to a high ranking job (as long and no one comes to push them out again.) This highest ranking promotion provides a player with a special ring that a player may place onto a giant cardboard hand on their side of the board. Depending on where a player places his ring(s), he gains special abilities on the board (so don’t lose your promoted workers or someone will take one of your rings….) The game has a variable setup consisting of different scoring cards and/or scenarios. 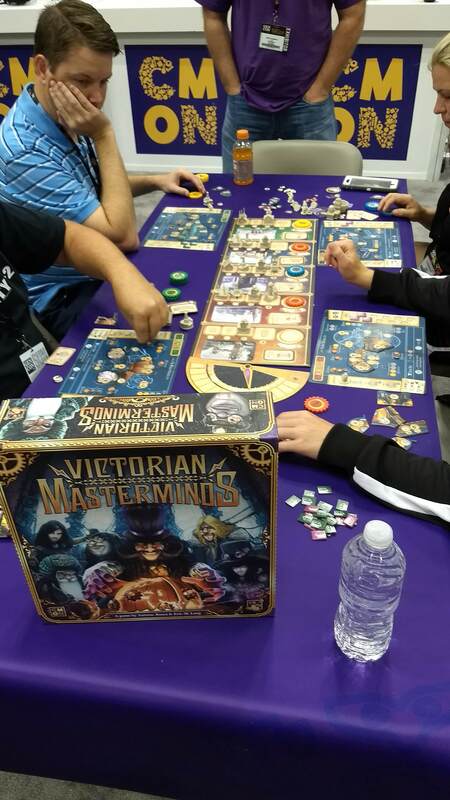 As is traditional, AEG had a huge pile of new releases on display at GenCon. There were the obligatory expansions (Smash Up had Oops You Did it Again: cowboys, vikings, Egyptians, and Samurai; and a huge (Bigger Geekier Box) to store everything while Mystic Vale had Twilight Garden) and then many completely new games. Magical Treehouse is a real time drafting game. Sort through your cards and pass them along as fast as you can, if your neighbor starts running slow you can draft from the deck. The first player done grabs a bonus scoring tile and then cards are played. Players reveal their cards to form a build their treehouse. Deploy your familiar on the board to collect ingredients for your spells. The game lasts about 30 minutes over the course of 4 rounds. 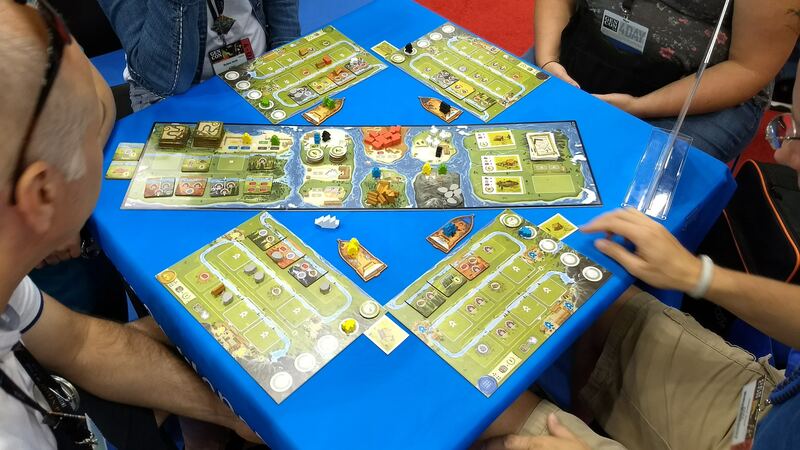 Greedy Kingdoms is a bidding/bluffing game from Japan (with some tweaks by Bruno Faidutti). 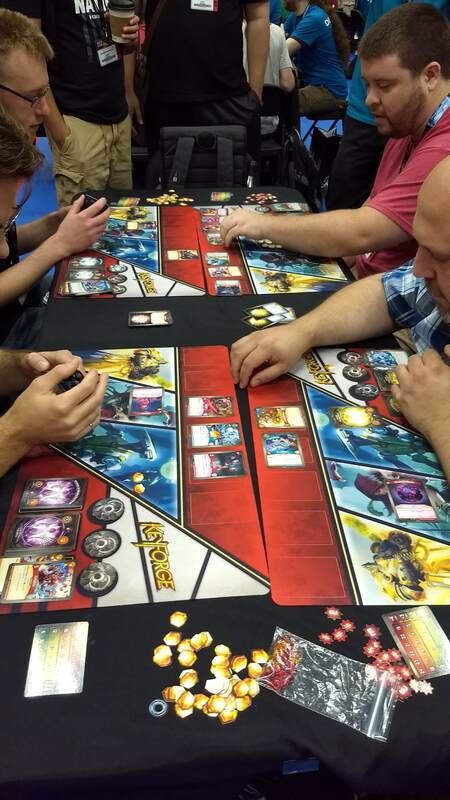 Players play three of 9 different cards in an attempt to attack and/or block their opponents. Successful attacks earn the attacker resources. Some attackers need resources to even power their attacks (the knight collects a large reward if you are able to provide him with food.) The game allows players to buy upgrades. A citizen is a one-shot power, locations grant a permanent abilities, and items are cards that are used and discarded. Players can spend 2 of the same resource to upgrade (at random) one of their attack cards (making it more powerful.) There is only one upgrade for each of the 9 cards in the deck, so player’s teams will quickly become unique. 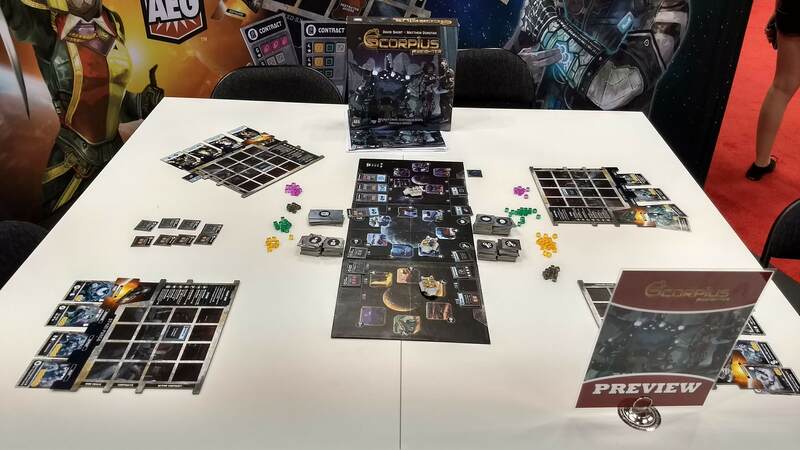 Scorpius Freighter is a push-your-luck game where players are smugglers. 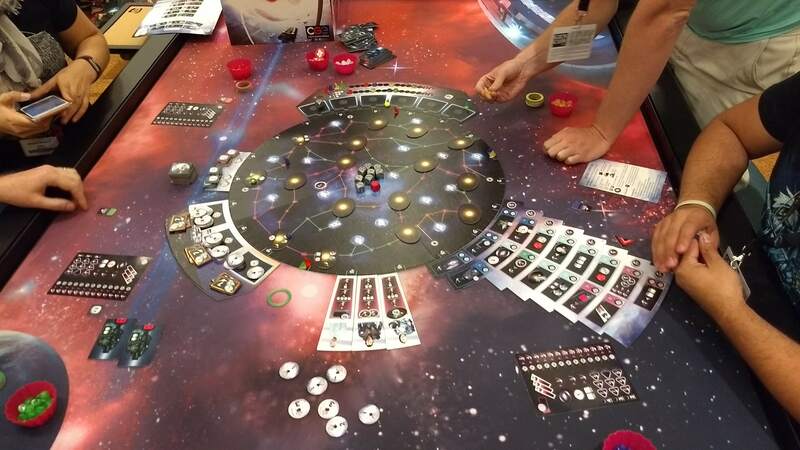 Player start with four unique characters/crew and have boards keep track of a player’s ship and any upgrades. Meanwhile, there are three plastic ships orbiting the three central planets where they serve as a rondel for player actions. Players move the ship from one to three spaces and every time it completes a circuit it gains another storage cube. When any ship is full the game ends. 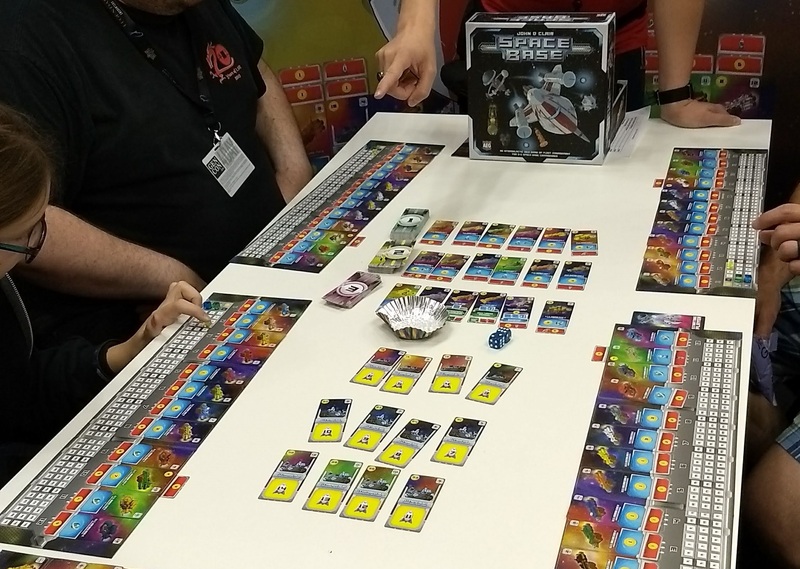 Space Base presents players with a wide tableau covered with numbers and pictures. However, the gameplay is actually rather simple. The set of 12 cards (docks) correspond to the possible rolls on one or two dice. Players roll two dice and then may activate either one or combine the two (so a 2 & 3 could be worth 2, 3 or 5.) Players upgrade their docks over time by overwriting previous cards at that location. Overwritten cards will generate a small income when the die is rolled on other players’ turns. Of course, docks have various powers as well and can interact with each other (say, scoring adjacent cards.) Aggressive take-that style of play is possible, but requires a bit of dedication in order to reach that spot. I was pleased to see a sequel to one of my favorite recent co-ops, The Captain is Dead. 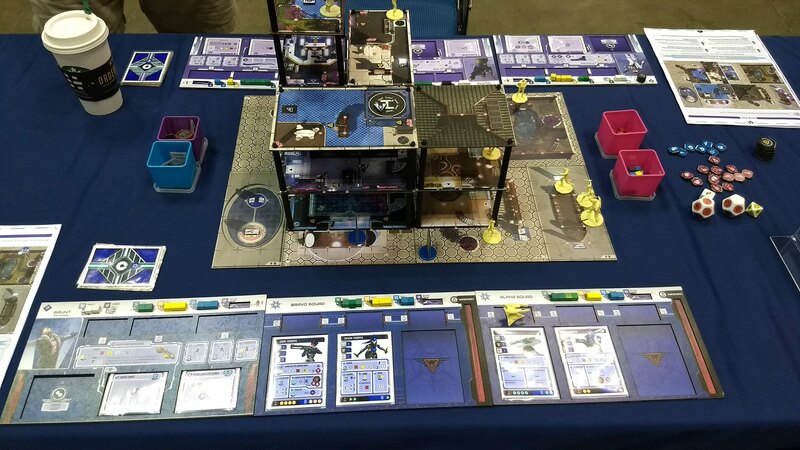 The Captain is Dead: Lockdown has players captured and locked away and they must find a way to escape. Rather than aliens invading, they are already present and players must find ways to stealth around the board, avoiding them. A concealment level gradually increases, making it harder and harder to avoid the guards. All the characters from the previous game are present, with slightly tweaked abilities along with two new characters (found in the prison, of course.) In addition, Alien Language is a new skill that helps players hack into the prison computers without being noticed. The game ends if everyone is dead (if you die, you spawn in as a new character of the same color) or you escape and win. 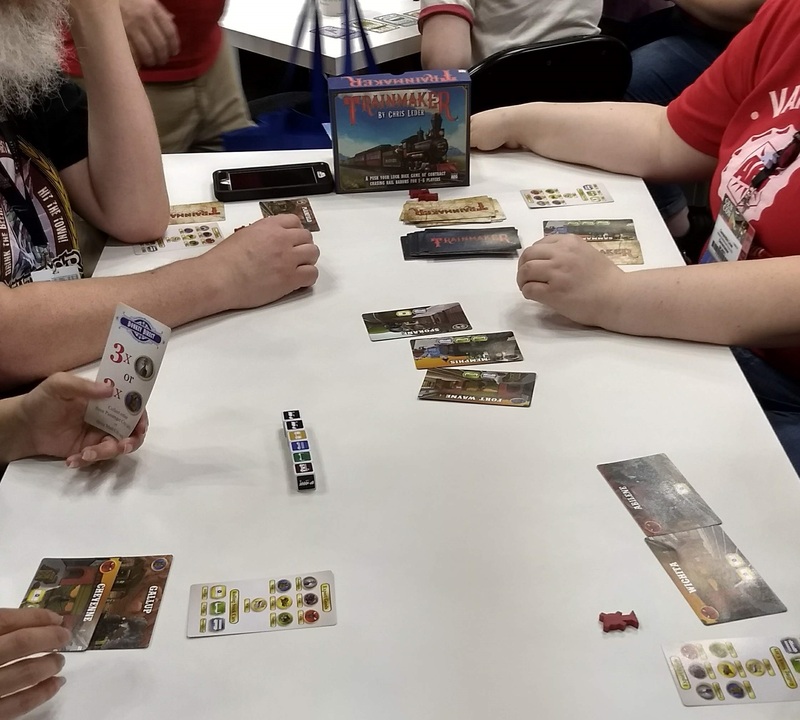 Trainmaker is a die-rolling push-your-luck that has players moving goods between cities. Players must roll the correct symbols for a route, but must ALSO roll at least one engine and caboose to complete it. War Chest is a somewhat abstract bag building wargame. Players draft four army types (out of 16) and then use them in a 1v1 or 2v2 game. Once army types are chosen, each player takes the entire stack of chips of that unit, putting two of each kind of chip in their bag. Players draw 3 chips and take turns taking actions. The goal of the game is to claim a specific number of control points on the board. As an action, a player may deploy the chip directly onto the board, discard the chip to move a unit of that type, or discard a chip to recruit another chip of that type into one’s discard pile. Chips have one health as a default, and defeated chips are removed from the game entirely. However, chips can be deployed on top of another chip of that type, essentially giving that unit an additional health point. 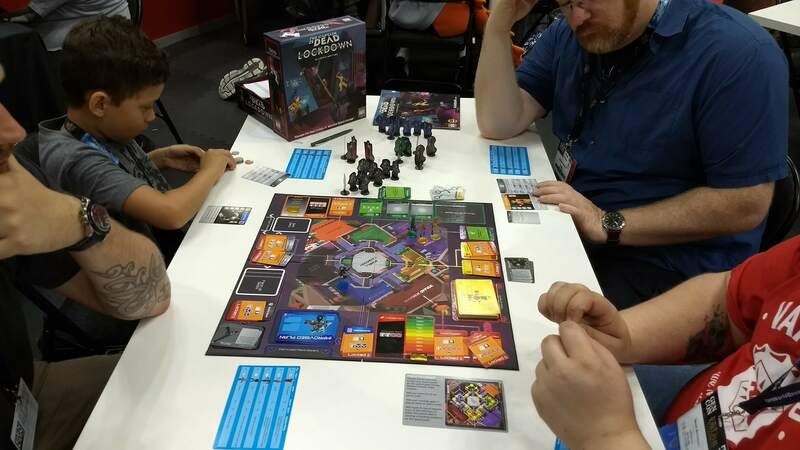 The third title in the Boss Monster series, Boss Monster: Rise of the Minibosses is a stand-alone expansion to the series where players play cards to build up their dungeon in order to defeat invading adventurers when they come. The two new mechanics in this release include coins which can be used to power certain cards or to power up mini bosses. Minibosses are found in the room deck, but are not rooms. They are played under a room card like an enchantment. 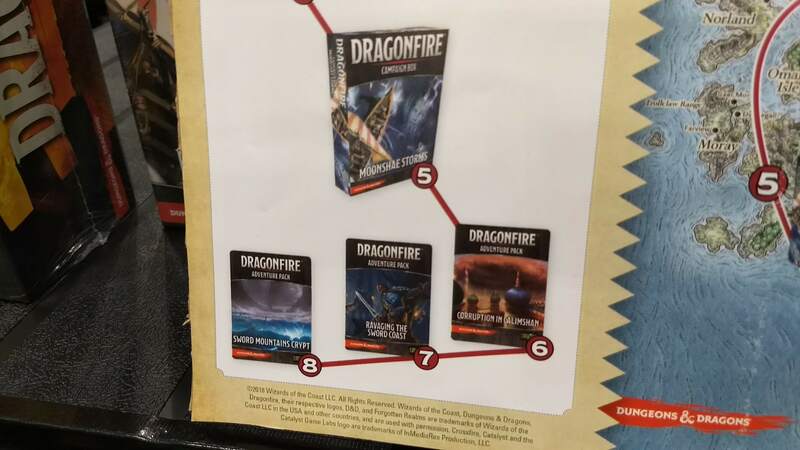 Call to Adventure was the game that initially brought me to the booth as the game has an upcoming expansion based on the excellent Name of the Wind series of books. Labeled as a “character crafting” game, players first create a character based on an origin, a motivation, and a destiny (which will be satisfied with certain conditions.) Players slowly fill in their character as they play the game. Challenges encountered have bifurcating paths, so players can choose how they want to upgrade their character. It is a primarily a tableau building game, with some engine building. Spending experience points for dark runes brings in a bit of push-your-luck mechanic as the dark runes can affect you later in the game. It is on kickstarter right now, with fulfillment to occur sometime in November. 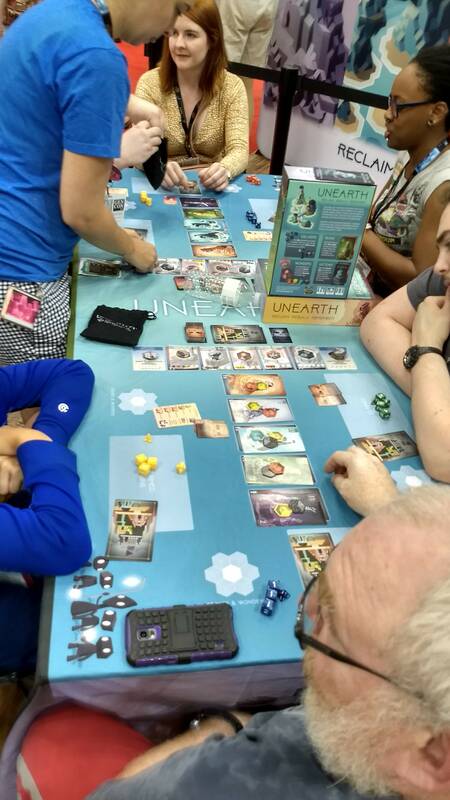 Unearth is another dice rolling game. Players roll their dice and place their tokens on a rune. When a set total is reached on a rune, the majority owner gets the rune card and other players gain a stone. Rolling high make rune collection easier, lower rolls will give players more stones. Players with stones can use them to build wonders, which gant them abilities later in the game. Catalyst’s Dragonfire has many similarities to their popular Shadowrun Crossfire series. Players start with a hand of cards and use them to attack and defeat various enemies laid out on the table. When all are defeated, the next round begins, advancing the specific scenario being played. Drawing cards is quite limited, so buying cards with money from defeated monsters is particularly important (they go directly to your hand.) The game is very campaign based with stickers that can be added to one’s character sheet to grant them upgrades in future games. The game is well supported with additional adventures for higher level characters. Last year saw three different adventures (in small plastic packs) released for use after the base game. This september a larger, boxed expansion Moonshae Storms will be released, followed by three additional small expansions Corruption in Calimshan, Ravaging the Sword Coast, and Sword Mountains Crypt all following later this year. Moonshae Storms will contain seven adventures with new setup and mission styles (like downtime activities during short rests), the Barbarian class, and a lycanthropy curse. The small adventure packs will contain new characters of the bard, sorcerer, and barbarian class respectively. Heroes of the Wild (also out Q4) will be a set of new character cards including the sorcerer as well as some monstrous race options (like Lizardfolk and Tabaxi.) A quick side note here, I did not previously understand that the expansions for the game need to be done in order, or at least you need to own all the previous ones. Some of the expansion story packs refer to cards released in previous offerings. Guess what? Catan Studio is putting out more Catan games! Go figure. 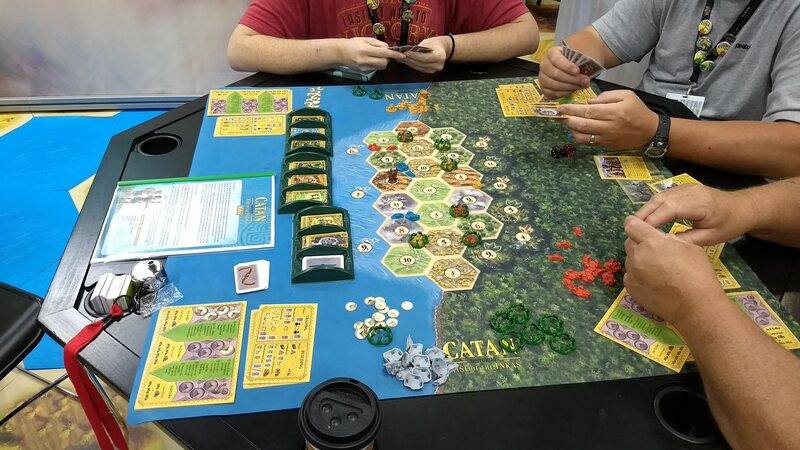 Catan Histories: Rise of the Inkas (out this fall) uses a long, narrow board sandwiched between the sea and the jungle. Commodities from the ocean and the jungle are more “efficient” sort of like using particularly good ports. Rather than a VP goal, players are trying to lead their civilization through three distinct phases. The first player to reach all three phases, wins. Things like “longest road” instead provides development cards. Watch out for that jungle, though as settlements can be overgrown during the game. 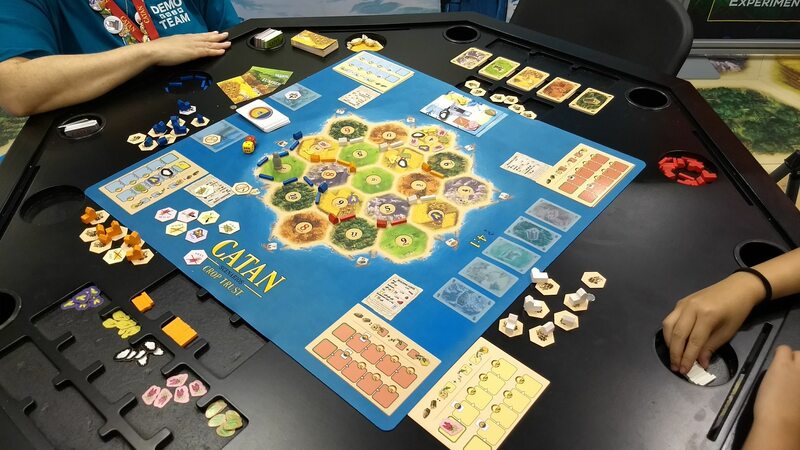 Catan Scenarios: Crop Trust (out in October) is an expansion to use with the base game. The go-green folks are out in force and players need to prevent special plant species from going extinct. Players need to harvest seeds to keep their economy rolling but collecting too many may endanger the seed diversity of the island and cause a collapse of the food supply. 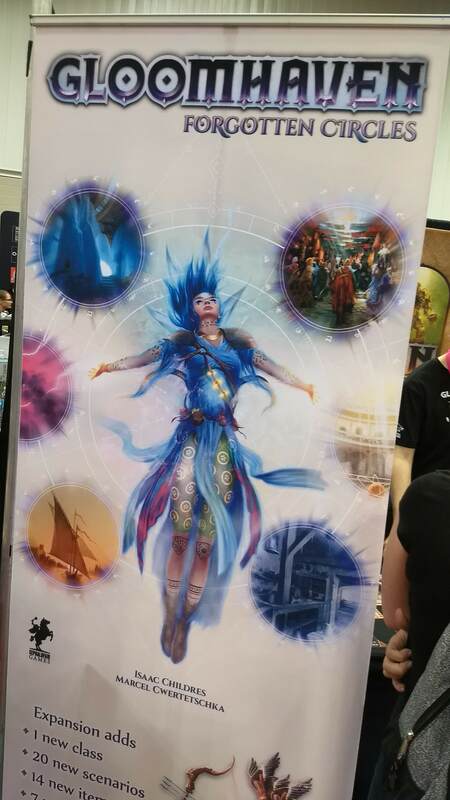 Cephalofair Games had a prominent banner declaring an expansion to Gloomhaven. Gloomhaven: Forgotten Circles should release in Q4. It will continue the previous campaign, providing 20 new scenarios, a new class, three new bosses, piles of items, and 7 new event cards. The book is also written such that some of the scenarios are “dynamic” meaning the layout is spread over several pages so that players don’t really know what might be behind a given door. Founders was at the convention and should be available everywhere in August. Set 300 years before the Gloomhaven storyline, it is a economic eurogame. Each player is assigned one of 9 possible races, each with a special action. 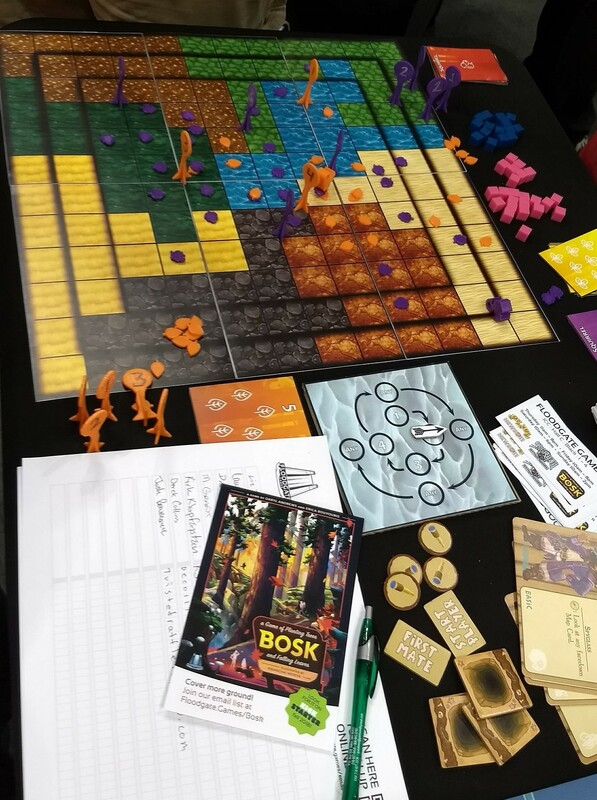 The various basic resources are then divided out to each player, with each player having exclusive control of two or three resources (depending on player count.) The game board has locations for each resource base. By building roads between two bases (his and another player’s) a player can produce a new, more valuable resource. However, the other player will also gain points for the use of her resource. For example, the rare resource might be worth 3 points so one point goes to the other player and the main player will get two. This continues up the chain for larger buildings using more resources. The last aspect are the prestige buildings. These provide points for players when a road is built from the resource building to the prestige building. This will give points to the player who controls that resources (with appropriate payouts to other players if their resources were needed in the construction.) To me, it seemed like a good portion of the game is in strategic placement on one’s roads and buildings so they can connect and chain together for the most points. 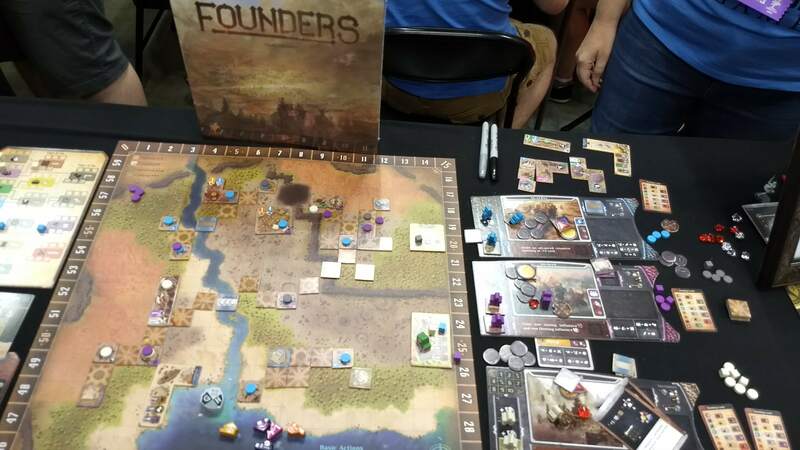 Founders is out in August, so should be in stores soon. Chip Theory Games has made a name for itself with its (kickstarter exclusive) dice-based dungeon crawl, Too Many Bones. The game is a cooperative dice builder that involves squad based tactical combat. The name comes from the idea of rolling “bones” – awards gained from failures that can then power up more interesting or powerful abilities later in the game. The newest expansion to the system is Undertow. It continues the storyline of the base game, but sends the party down the river. Players may now have battles on a raft, where the raft can absorb some damage but too much will cause it to sink, ending the game. There are two new characters (a third available as an add-on) all with very unique abilities and play styles. New enemies include mechs and an underwater Krelln(?). There will also be a campaign mode where players can link three tyrants (boss battles) together in succession, possibly stealing some of the power of the first bosses to use against the later ones. Chip Theory Games has another kickstarter coming in October. Cloudspire will be an entirely new game system, based off of a tower defense theme. I still think of CMON as “that miniatures crazy company” but they’ve come a long way and are now putting out some nice euro-style games that pique my interest. Gizmos has been generating a buzz. You are a student at the local science fair out to prove you are the best. 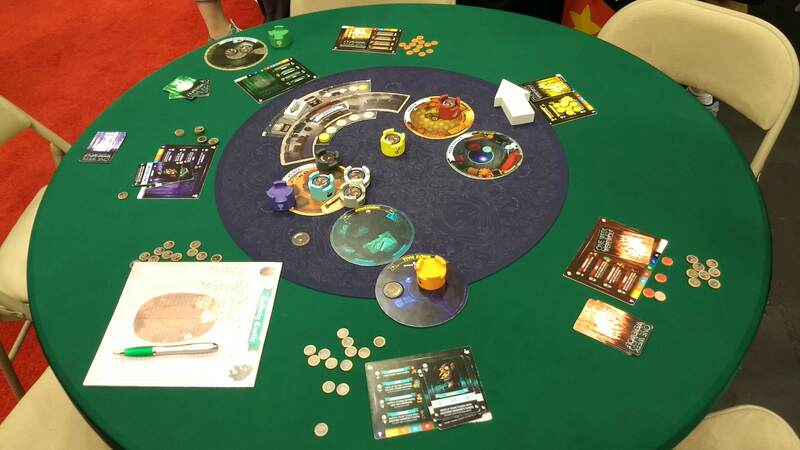 Each turn a player either chooses a card, takes an energy sphere (marble), build a (gizmo) card from the middle (using your spheres), or take a card from the middle to build at a later time. Each gizmo powers up one of your actions (like making one blue sphere worth two.) The game ends when someone builds their 16th gizmo or someone manages to build 4 gizmos of level 3. 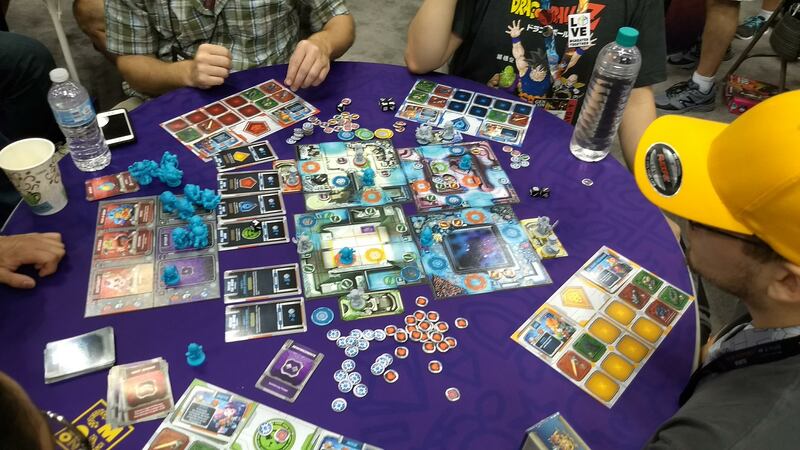 Starcadia Quest is a new version of Arcadia Quest, set in a sci-fi setting. The goal of the new game will be to take the previous game and make it much more family friendly. Setup is quick and easy using scenario cards (which also provide for variable setup options – any given monster might appear in any scenario.) Event cards are dealt to all players and they MUST play them at the end of their turns. Typically they are not good, but only the player knows what will happen at the end of their turn. Weapons tiles are used instead of cards, so they flip over when used. Finally, players only have to manage two characters per person instead of three. Look for it on Kickstarter on August 28th. As a science guy, of course I wanted to hear about Cranio Creations’ Newton (which sold out at the show, in stores in November) Players take on the role of students who want to become like Newton. The board features a map of Europe with many of the big name universities displayed. Each round players play five cards out of their hand and use them to travel around the board, work to earn money, gain cards, etc.. At the end of each round (there are six), players take back all but one of their cards. Thus they lose the ability to do that specific action, however if they trigger that action in other ways it will give an improved effect. The goal of the designers was to create a game that put its complexity into the decisions that needed to be made, not the rules that had to be learned. 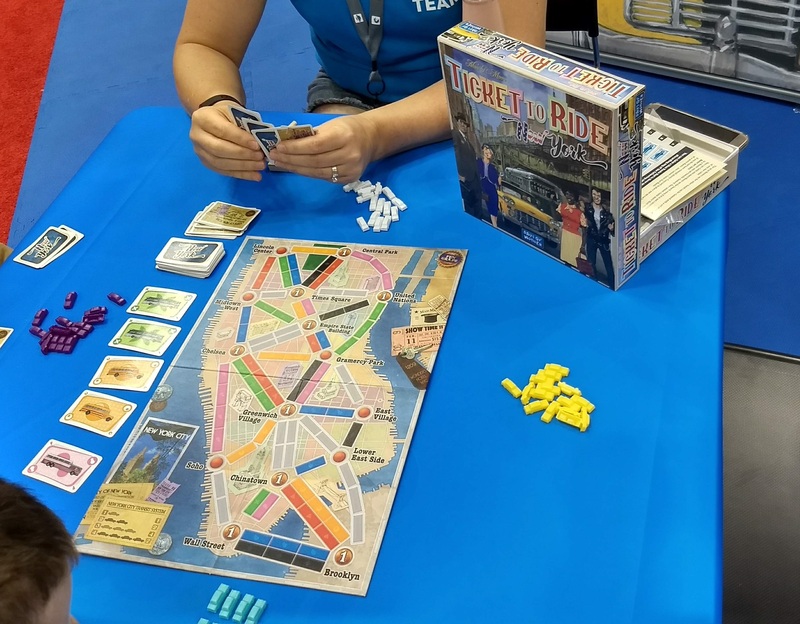 Ticket to Ride: New York saw regular play at the convention. I find it amusing that the play style at convention demos inspired the creation of a faster Ticket to Ride game. 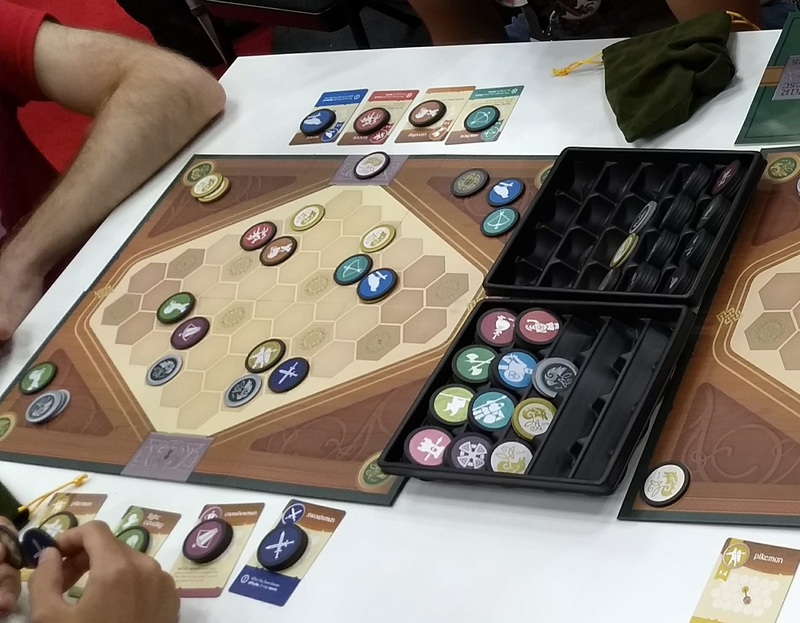 Things are pretty much standard for the game, other than a smaller board, except that some cities have “pennies” on them which means players score a point for each connection they make to that city. 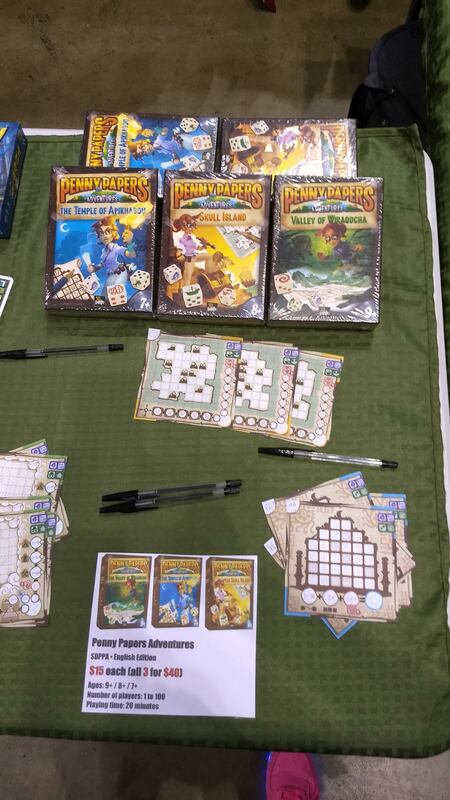 The big game buzz at Days of Wonder was The River. It’s a worker placement, collect resources, build tiles, collect VPs sort of game. Players place workers to take building cards, build building cards (grant VPs), collect resources, take the first player marker, take a tile (when placed it provides additional production, storage, or VPs), or to swap one’s tiles around. Tiles are placed onto a personal board lined up along a river that flows back and forth across the board. Placement of tiles is important as lining up two or three tiles of the same background earns points at the end of the game (thus the importance of the swap tiles action.) The game ends when one player builds the maximum of five buildings or finishes their river (12 tiles.) The second building built will grant a player an extra worker. However, as players place tiles, they begin to LOSE workers. Thus, if a player completely finishes their last tile location, they will only have a single worker to use on their last turn. I can see how the buzz can develop as the game seems to be easy to teach, play quick, but still have a satisfying feel of economic development. 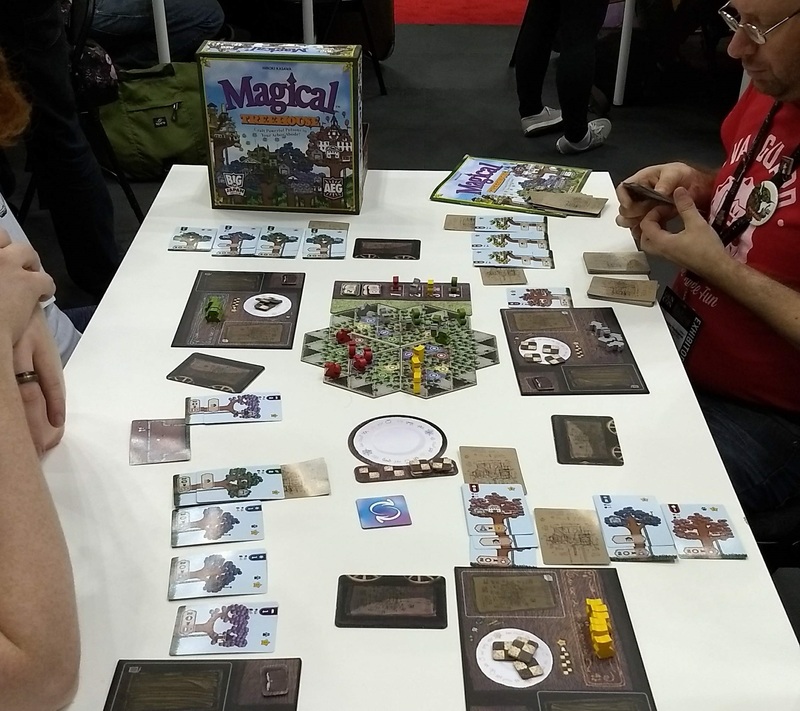 Magic Maze requires players to cooperate in order to deliver four pawns in a maze to their home base, then move them all to escape. The catch lies in their moment. Each player can move any pawn, but only in one direction. One player may be able to move any pawn to the left, while another can only move pawns upward. Set against a timer, players race to complete the challenge, but are not even allowed to speak to discuss the situation. Their only hope is to place the “attention” marker in front of someone whom they would like to take an action (thus spurring them to scan the board for the missing opportunity.) 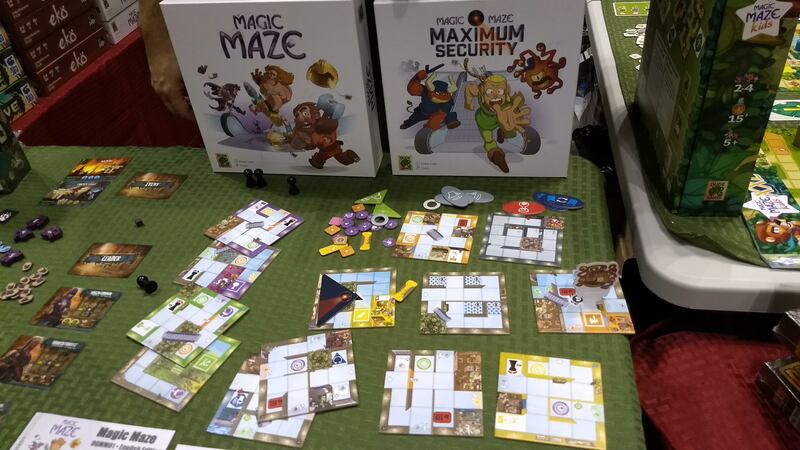 Magic Maze: Maximum Security is an expansion to the game adding a ton of special powers and difficulties to the maze. For instance, a giant beholder figure may start on the board, blocking movement. Players must also manage its movement while still trying to get things done. The expansion treats the maze as a giant mall, adding in a mall cop (who can be summoned away from its station) or security cameras (which can be rotated around while other characters sneak by.) I have down here that now there are even ways to destroy walls if needed. To compensate for the added difficulty, players are given a few Talk Tokens which allow them to briefly speak as well as one free reset of the sand timer. For those alway looking for a further “win condition”, the expansion lists out 42 different achievements that can be accomplished over the course of many games. Dv Giochi’s Catalyst, which came out this past summer, was on display. It’s a gain resources and attempt to make combos type of game. A set of 5 cards are placed in a tableau. 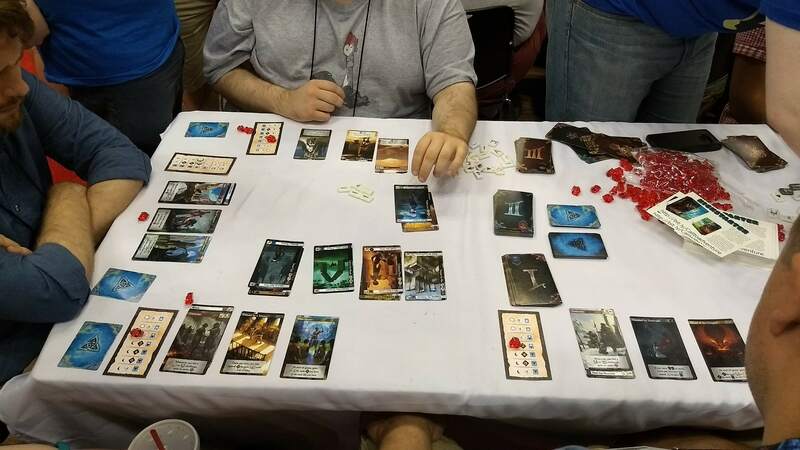 Players choose one action per turn, either collect contributions (via coins – the value equaling the highest cost card on the tableau), acquire a catalyst (pay for a card on the tableau, modified by its position in the row), or activate a catalyst (using its ability.) Here’s where the combo starts into play. If one buys a building card, it gets placed below a catalyst card and is activated whenever the catalyst card is activated. Some cards grant the ability to activate other catalysts and thus players can start to chain things out to become more powerful as the game progresses. The game ends when the deck is used up. Players count up their points on cards, points for military tokens, and any points created during the game. 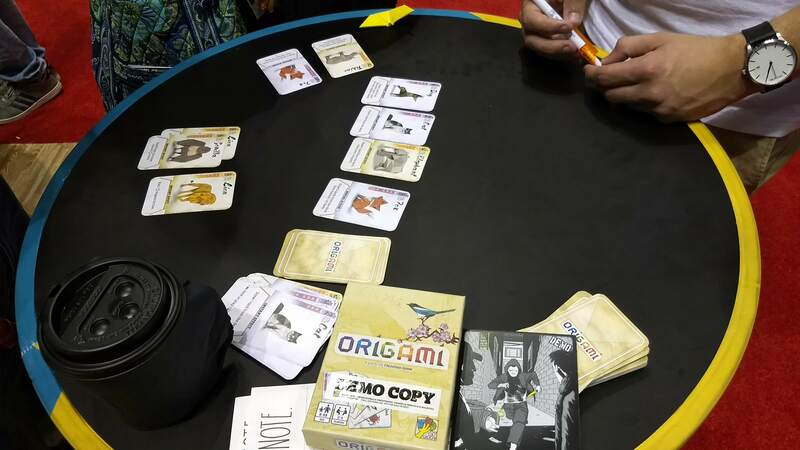 Origami (complete with little folded crane for first player) is a card game that has players taking cards from a tableau and playing them into one of two columns in their play area. Players either draw cards, play a card (paying the exact cost in folds), or use a special action on one of their cards. All cards have a “fold” value in the corner and players may take up to 4 folds worth of cards when drawing from the tableau. Players play cards into one of two columns, covering up any previous card ability when placed. Note that the two columns must be kept relatively even in that the difference in the two piles must be 1 at most. Special actions on the card are typically instant actions or some end-game scoring ability. 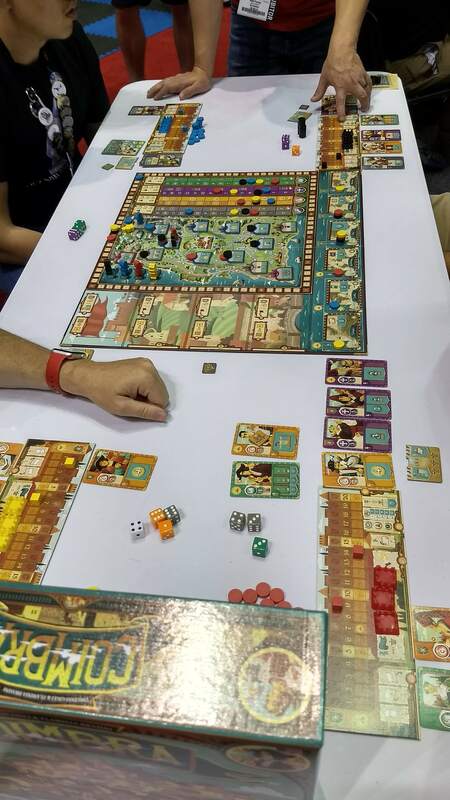 Coimbra is a game in Plan B’s Eggertspiele line of games. It is a medium weight euro where players are drafting sets of three dice and use them in three possible ways. Higher numbered dice cost more resources but they also get to go first. The dice are used to manipulate four different colored tracks which determine a player’s resource income which can then be used to purchase or activate various things for a final point salad scoring method. The game is meant to be a solid euro but not quite as harsh as they can sometimes be. 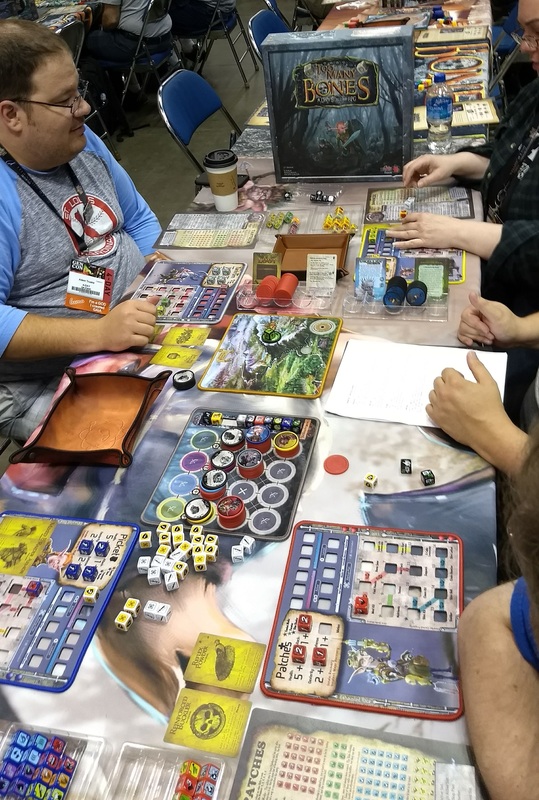 One of the big games in the Fantasy Flight areas was the new Arkham Horror, 3rd Edition. 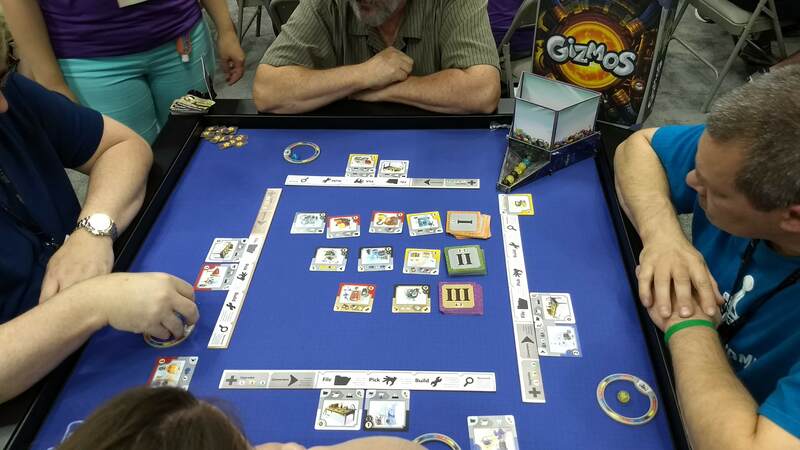 As you can see in the photo, the game now uses a modular board to lay out the town differently each time. There are new branching narratives where players make choices that affect the development of the game. The game has tweaked the rules, characters, etc… will offer four new scenarios. 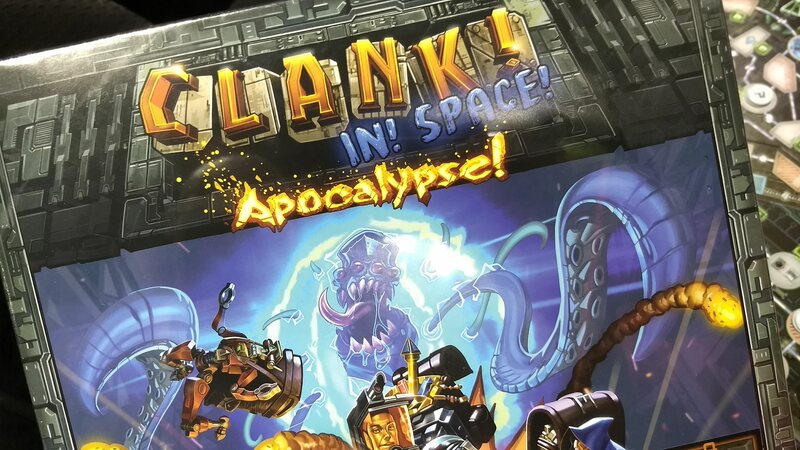 The other biggie is the strange KeyForge: Call of the Archons. It is a two player card game where each player is attempting to collect enough amber (resources) to forge three keys. Cards either advance one’s own progress or attack your opponent to hinder theirs. The big gimmick for the game is that every single deck made will be different than all the others. They will even have different card backs (including deck names.) Each deck has 37 cards made up of three of the 7 different houses in the game. The basic game will come with two predetermined decks to teach the game and then two of the unique decks to try out. 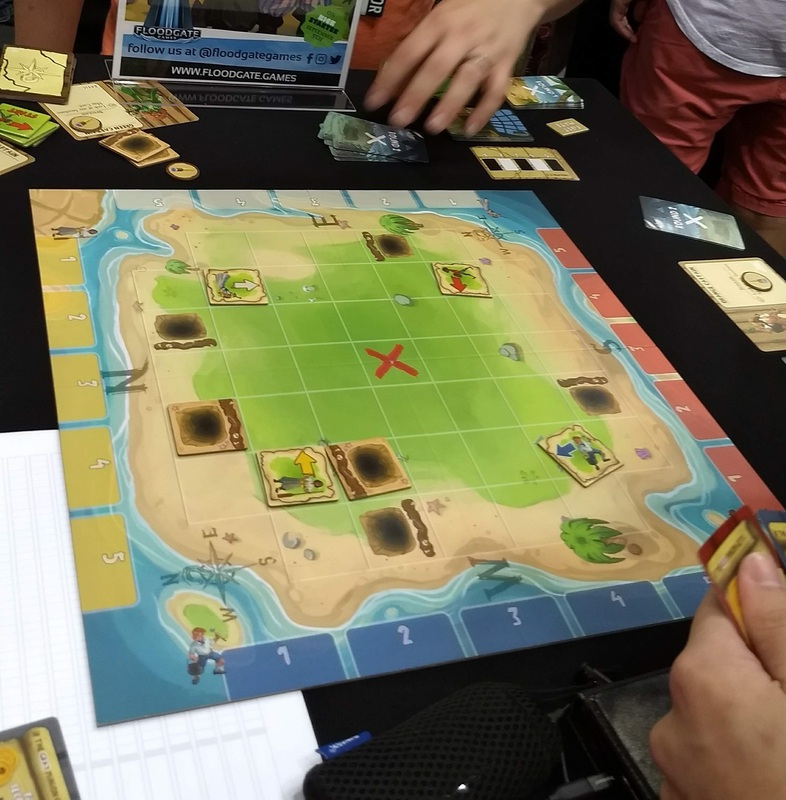 Bad Maps (Kickstarting Sept 5th) has players laying down cards to program the movement of four different pirates on an island with a central treasure. Once all slots for all the pirates are filled, they execute their movement. Cards are placed face down, but the back of the card indicates whether it is a move card or a direction change. Players do not have direct ownership of any pirate, and they may lay down cards to program any pirate. Instead, players are trying to get the pirates into specific formations shown on their scoring cards – things such as closest too or farthest from, specific formations, etc… Once all pirates go through their program, points are scored, the pirates make four pits on the board, and then go back to their starting locations. Players get new goal cards, and the game goes through a second and final time. Players also get spyglass tokens which let them look at a specific card, or can be used for special powers in the advanced game. 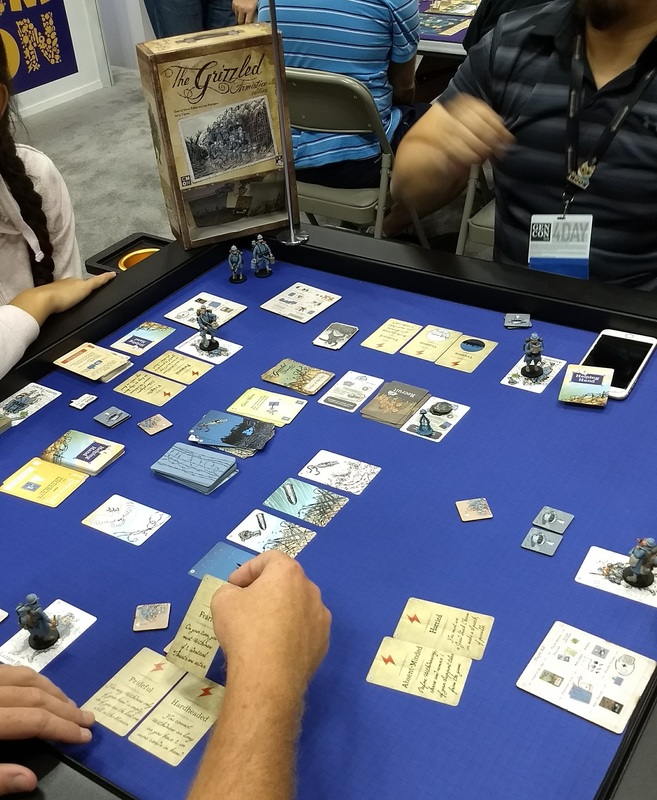 This entry was posted in Convention Report, Reviews and tagged Gen Con 2018, Gloomhaven, the river. Bookmark the permalink. A fab and extensive summary of so many games, so thank you for that, and already really looking forward to reading part 2! Of the games mentioned I’m particularly interested in Tudor, Bosk and The River, with Coimbra loosely ‘on my radar’ and Agents of Mayhem raising an eyebrow… I can’t shake the feeling that Space Base is just a Valeria-style clone set in space, though…? Great reading all the same, so thanks again! Excellent review of so many games.